Right about now, with a Nor’easter blowing cold, wet snow across the gray landscape of New England, I can easily picture myself on a white sandy beach, sun shining, crystal blue water beckoning…can’t you? We can put you in that picture! Our travel agents, Allie and Wendy, have bit the bullet and taken a few junkets to the fabulous Sandals & Beaches resorts in the Caribbean. 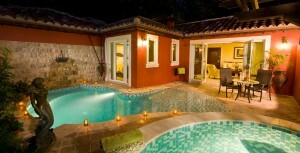 Sandals, known for their posh hotels and spas, offer a myriad of activities to suit any traveler’s needs. If you want to hit the fairways, we can send you to Emerald Bay, Great Exuma in The Bahamas, where you can putter on the award-winning Emerald Reef course designed by golf legend Greg Norman. Or, maybe you are looking for a romantic honeymoon retreat. We recommend Grande Antiqua, voted the “world’s most romantic resort” 14 years running. This special resort touts unique rondovals, round-shaped villas with conical roofs nestled in the tropical foliage; each comes complete with private butler! Allie agrees—it’s very grand! For a family vacation, the Beaches resorts on the islands of Jamaica and the Turks & Caicos have been voted “World’s Best Family Resorts” at the World Travel Awards year after year. All of these special retreats offer all-inclusive packages, fabulous food, exquisite accommodations, and plenty of fun activities. And then, there’s the world class Spas…Aahhhh, need I say more? It’s a tough job, says Allie, traipsing to these exotic locales to test the waters, literally, for our clients. Really, we do it for you! You can’t find that kind of first-hand knowledge on the Internet! If you are looking for something a bit more adventurous, what about a seabirding expedition to the Cay Sal Bank, in the most remote archipelago of The Bahamas, with really fun wildlife biologists? It’ll be an experience of a lifetime, if you like that sort of thing!